To add or remove Search Engines from the Search bar, click the down arrow next to the search site icon, then click Manage search engines. To find search engines to add, click Get more search engines. 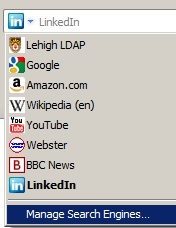 When you find a Search Engine you want to add, click Add to Firefox. On the Add Search Engine prompt, check the box Start using it right away and click Add. To use the search engine you added (or to switch to a different engine in your list), click the down arrow next to the site icon in the Search Bar and choose the engine you want to use. Enter a search term and press Enter or click the Search icon. 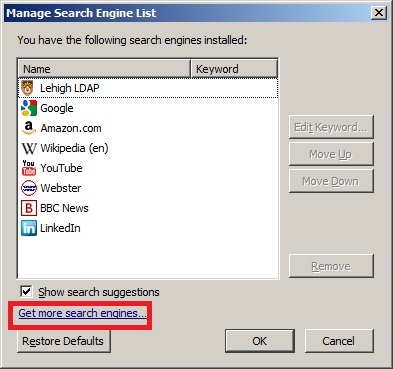 Tip: You can search Lehigh's phone/email directory by installing the Lehigh LDAP Search Engine.